The couple had their close friends and family members in attendance. They had an intimate wedding. 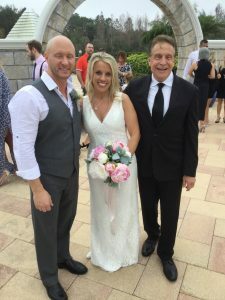 Lon Tosi from the Orlando Team of officiants for Sensational Ceremonies worked the Kim and Dan to create a ceremony that truly told their story! It included among other things the Blessing of the Hands which spoke of the importance of their hands in their relationship. That particular reading starts with the following statement: “These are the hands of your best friend, young and strong, and full of love for you”. And it ends with the following words that are so impactful: “And lastly, these are the hands that even when wrinkled and aged will still be reaching for yours, still giving you the same unspoken tenderness with just a touch”. Literally, this wonderful reading tells the entire story from beginning to the end of a couple’s relationship. So beautiful! Lon also had Kim and Dan write special words of love to one another. Dan wrote of Kim’s kindness and love for his family. He feels that she “always puts him first” and that she makes him “feel secure”. Kim wrote about his love of Christ. She knows that he makes her better in “every aspect” of her life. She believes that they are a team and that his positive attitude motivates her each and every day. The ending reading just before the pronouncement speaks to the future for the both of them. It speaks of the future as a “long and winding road whose every turn means discovery” . That same reading tells them that their adventure has just begun! Wow! That is so exciting for Kim and Dan. Their adventure is going to be so exciting for them! Along with the wonderful group at the Hilton Grand Vacation Club at SeaWorld, Married By Mail and Sensational Ceremonies contributed to their amazing wedding cerebration. Married By Mail secured their Florida Marriage License, and of course, Sensational Ceremonies executed a beautiful intimate wedding ceremony. Kim and Dan, we wish you much luck and happiness with your marriage!